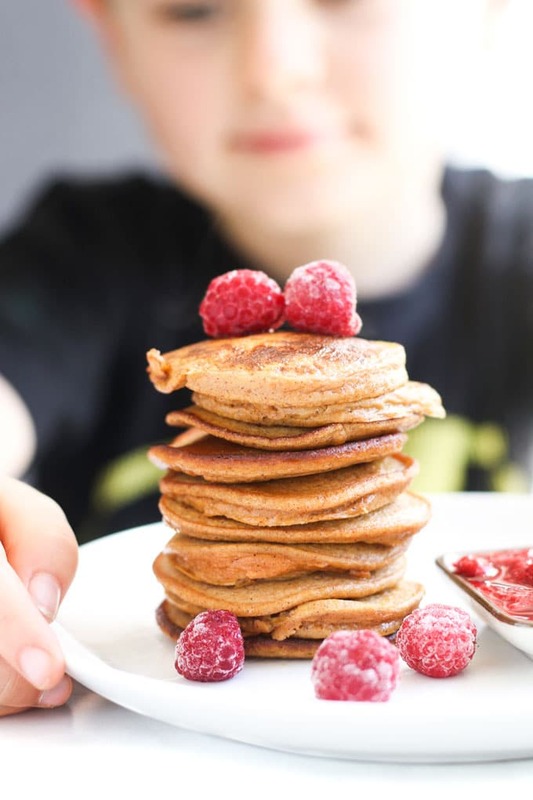 Sweet potato pancakes made from only two ingredients. I have been making sweet potato pancakes ever since Rory started solids. They are perfect for baby-led weaning as they are easy to pick up and have a lovely soft texture. For months now I have been meaning to post this recipe but Rory doesn’t like to wait for his food in the morning and, therefore, I have never had a chance to take a decent photo! We love banana pancakes and these are a little similar. Like banana pancakes they only have two main ingredients and no flour. I do find these easier to flip and feel that they are a little more fluffy. The next time you are making something with sweet potato then make a little extra and give these a try. If you have a lot left over then why not make some of these sweet potato truffles too! 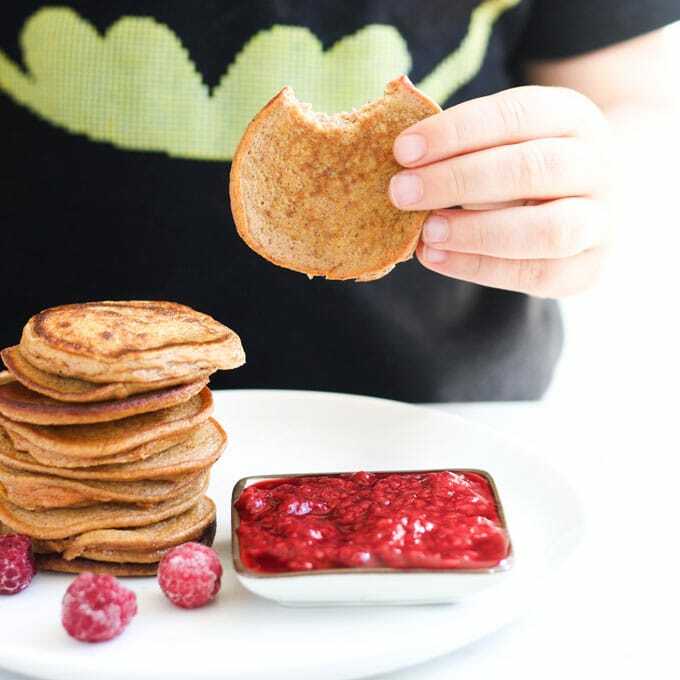 Made from only two ingredients, these sweet potato pancakes are a fantastic finger food and perfect for baby-led weaning. Mix the eggs and sweet potato together with the cinnamon and ginger. These sound great. If I don’t tell my son what they are made of, I think he’ll love them! Fingers crossed Sarah! Both my boys LOVE anything sweet potato so these were a winner with them! Thanks Alison. I haven’t tried sweet potato bread before. Will have to give it a go. Is it good? Thanks Sarah. My 11month is obsessed with anything sweet potato so I’ve been cooking with them tons lately! This is such a great idea! I am going to try them! I’ve never even considered using sweet potato in pancakes before. 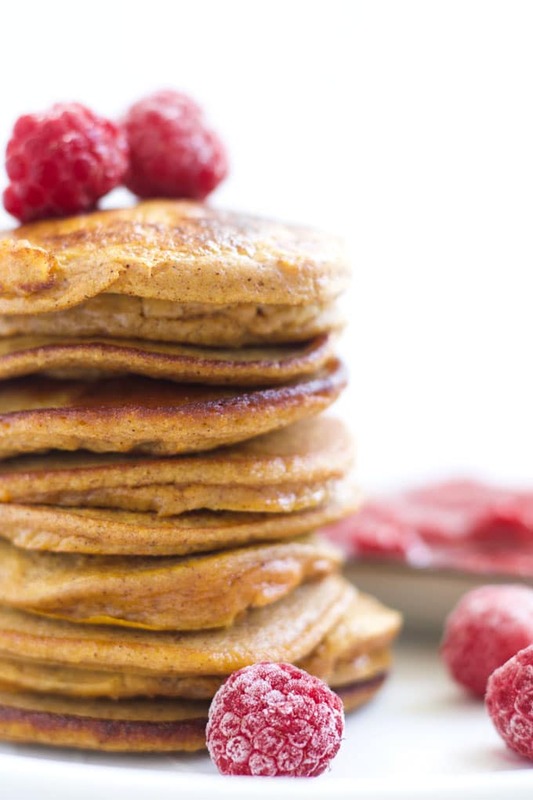 Must try these + the banana pancakes too. Thanks Toni! I like the taste of the banana pancakes better but the texture of these. My kids gobble up both! Thanks Maxabella. Have you tried banana pancakes? 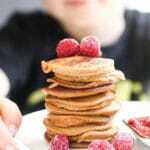 They are a bit similar textured to them but I do find the sweet potato pancakes slightly thicker and easier to handle. Spotted these on #recipeoftheweek and had to come and take a look. They are a wee bit similar to Scottish Tattie Scones. Thanks Claire! I love tattie scones! These don’t really taste like them but still good! I love the idea of these. I quite often have a bit of leftover sweet potato so I’ll have to give these a try next time I do. Thanks Charlotte, let me know how they go! I can’t believe how few ingredients these pancakes have! 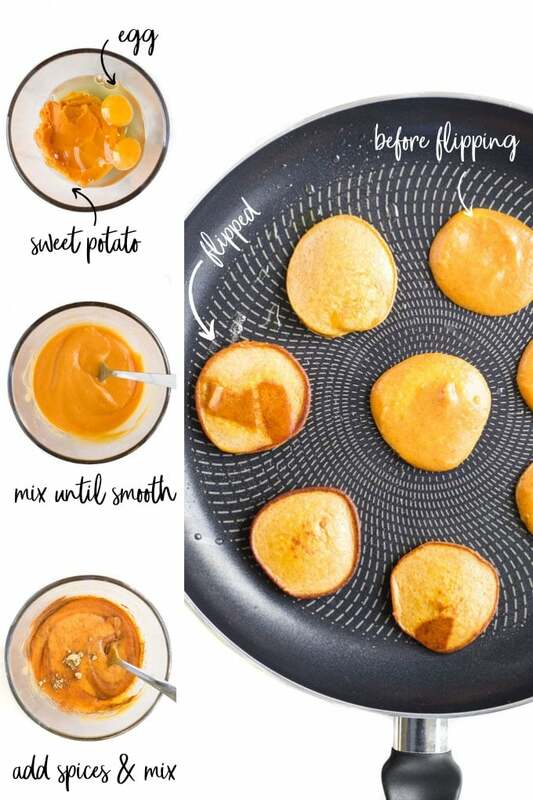 Sweet potatoes are a favorite in my household, so I’m sure these pancakes will be a hit. They look fantastic! I’m sure they will, my boys are huge sweet potato fans too! Love how easy these are! I have never used sweet potatoes in baking or cooking (I know. I’m crazy!) Need to make this soon! Thanks Cathleen. I never ate sweet potato really until I started weaning Finn. Now we have it A LOT! Thanks Morgana, I hope they are a success! I love this! And the photo is incredible, I wouldn’t want to wait for my portion either! I am gluten free so this is right up my alley. Perfect fall recipe, I am pinning. I gotta try these! Thanks. These look great. My girls love making pancakes with me and love adding the veg themselves 🙂 Will have to try without the flour and just the sweet potato and egg next time! What did you top your sweet potato pancakes with in the photo? I just topped with some greek yoghurt. We have greek yoghurt with a lot of things….! wow this taste wonderful ! thanks for the recipe ! Can you freeze these and have them later? Hi Rishni, I can’t remember if I have ever frozen these but I would say they would freeze well. I would fully cook, allow to cool and then freeze on a baking tray before transferring to a freezable container/zip lock bag. Great, thanks I’ll give it a go! Hi, would this work with pumpkin also? Have a can of pumpkin to use!